Investment Advice - new president new investment planning? 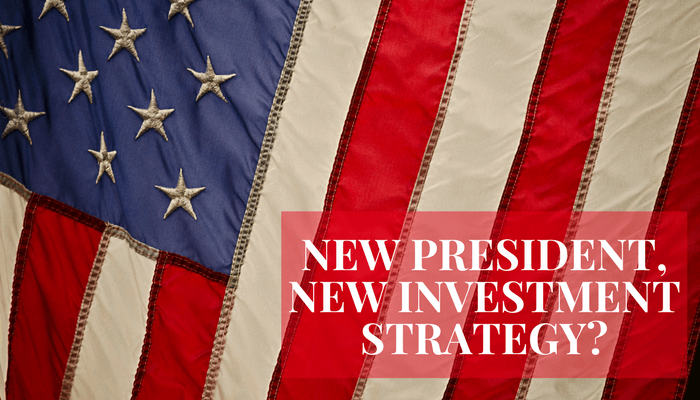 Blog Investment Planning - What does the new president mean for your investments? Investment Planning – What does the new president mean for your investments? After one of the most acrimonious presidential elections in recent US history, Donald Trump will be inaugurated as US president tomorrow. He will become the most powerful man on the planet, and the leader of the world’s largest economy. He’s certainly been outspoken on his views, including radical changes to US economic policy and international trade. You might think, therefore, that his appointment will lead to some big shifts in our investment planning, but it won’t. Here’s why. Can investors gain an advantage by predicting the impact of US policy? Trump has already announced some of his policies. Some investment managers believe that knowing what these will be gives them an ability to benefit. They will position their investments based on their predictions of how those policies will play out. In short, they’re making investment decisions (with investors’ money) based around their ability to foretell the future more accurately than anyone else. We believe that current market prices are an up-to-the-minute snapshot of the aggregate expectations of all participants in the market. In other words, at any given time, stock (or bond) prices are a fair reflection of what an investment is worth. There are millions of market participants (investors, fund managers, banks and governments) around the world, and each one of them is acting (buying or selling) based on their expectations about future returns. Buyers and sellers are in effect exchanging opinions about future returns, at the same time they are trading assets. Those opinions include views about the impact of the new president and the policy changes they expect. Unanticipated future events may of course lead to changes of market sentiment in future. However we feel it is highly unlikely that investors (or investment managers) can gain an edge by attempting to predict what impact the new president (or indeed any other event) will have on markets. So why make that a factor in your investment planning? So how have US elections impacted investments in the past? The market impact of presidential elections is smaller than you might think. In the US stock market since 1926, all the months during which presidential elections have been held fall well within the typical range of returns, regardless of which party won the election. The chart below illustrates that regardless of which party won, the US stock market has provided substantial returns. This is because the markets aren’t just powered by decisions made by political leaders. Markets are driven by a complex blend of (among other things) commerce, enterprise, risk, finance, hard work and innovation. For example, the number of US patents granted has tripled since the 1960s. It’s no wonder that markets thrive, regardless of political regimes, and will continue to efficiently allocate capital for innovation, progress and profit. Investment Planning – what does this mean for other markets? We believe it’s also reasonable to apply the same long-term thinking to other markets and to other macro events, such as Britain’s planned exit from the EU and leadership elections elsewhere in Europe. No-one knew the outcome of the US election or EU referendum before they happened, despite what the opinion polls were saying at the time. We STILL don’t know what the outcome or effect of these events will be in terms of economic growth, or stock market values. However, we DO know that current prices express the current overall expectations of all buyers and sellers. It’s hard to believe that any fund manager can know more than the market as a whole. 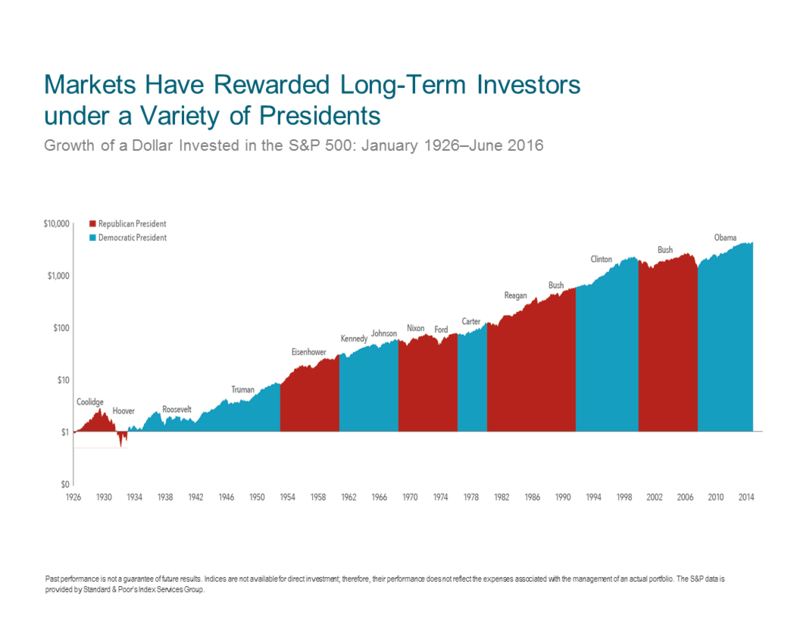 We also know that in the longer term, markets reward patient, disciplined investors. If you’d like to explore what this approach could mean to you, your portfolio and your financial plan, why not get in touch? Vital Wealth Management is a trading style of Johnston Financial Limited, who are authorised and regulated by the Financial Conduct Authority. Johnston Financial Limited is Registered in Scotland, No. SC108188.